While working on my medical office project I have been trying to find ways to bring in some warmer and more organic elements to soften all of the black white and gray elements and colors that we have going in there, and doing so with budget options in mind. Since this is a medical office, function is typically priority so saving a little here and there is a rare but much needed opportunity. One place that I struck gold is down the main hall way leading to the restrooms as shown below. In this cringe worthy picture taken from my i-phone you can see the dark black floors and the grey walls with the still raw doors and frames. 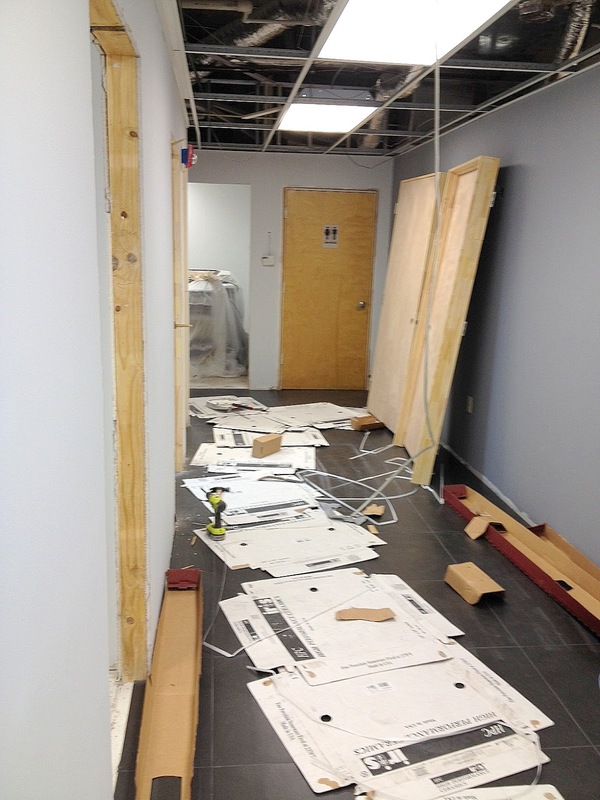 That long wall next to all the open door ways (which are exam rooms) is where I plan to put some custom photography art as well as 3 "affordable" benches. When looking for affordable accent furniture I never over look Overstock.com and Amazon.com where I have found some gems. It's also nice to see all the previous customer product reviews. Here are the two that I presented to the client. 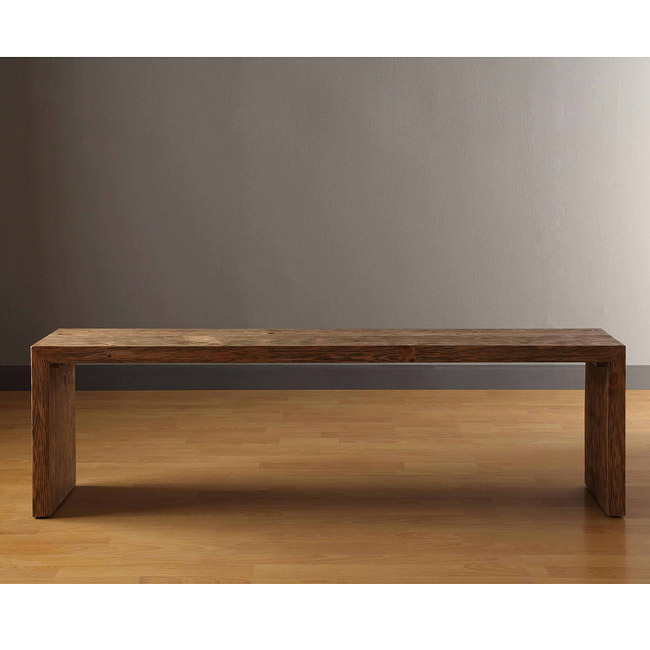 The one above is a smooth gray-ish wood that measures 60" and costs only $182.99. I love that with all the leather and metal that we have coming in here, 3 of these would be such an unexpected feature. The one above is my personal favorite and also the client's choice. 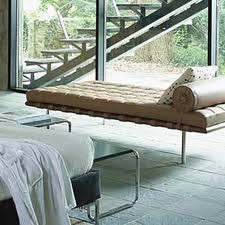 It is also 60" in a white leather with a natural wood base and chrome legs. 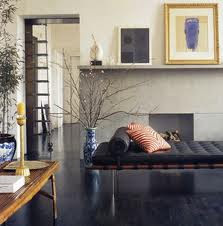 This bench still keeps it modern while lightening up that hall way and bringing in some nice organic tones. At a price of only $240.99 how can you beat it! 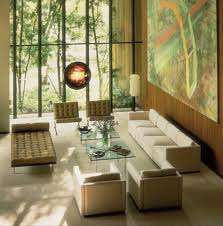 If the above bench seems familiar that's because it resembles the Barcelona day bed (and the Barcelona style) from Mies van der Rohe from Knoll. 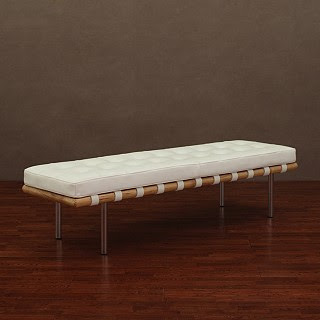 I like we're bringing in a little designer inspired bench (or 3) to give this medical office some real style. I want the second bench!